Start dates are shown for all stations on the air or with a construction permit by Sept. 30, 1948, when a freeze on new applications was imposed. The following people have contributed to this page: Donna Halper, Bob Carpenter, Joseph Gallant, Paul Lindemeyer, Wesley Orr, Dan Kallenberger, Mark Leff, Pat Dyer, Neil Nelkin, Dave Robertson, Al Robinson, Xen Scott, William V. Sutherland, John Ross, Teddy Dibble, Chuck Davis, Tom Hoehler, Bill Hepburn, Rickey Stein, Garrett Bauer, Bill Myers, and Todd Kosovich. Suggestions are welcome via email. This page was last revised on Jan. 7, 2019. 1875. George R. Carey of Boston proposes a television system in which every picture element is transmitted simultaneously, each over a separate circuit. 1880. The principle of scanning an image is proposed, by E. E. Sawyer in the U. S., Maurice Leblanc in France, and others (approximate date). 1921. Charles Francis Jenkins incorporates the Jenkins Laboratories in Washington for the sole purpose of "developing radio movies to be broadcast for entertainment in the home." May 19, 1922. Charles Francis Jenkins achieves his first successful laboratory transmission. Oct. 3, 1922. Jenkins first public demonstration, using Navy station NOF in Anacostia. He transmitted pictures, rather than television in the modern sense. The photographs were sent by a telephone wire from his Washington office to NOF and they were then broadcast by wireless back to the Post Office in Washington. Dec. 29, 1923. Zworykin applies for a patent for an all-electronic television system. June 13, 1925. Charles Francis Jenkins achieves the first synchronized transmission of pictures and sound, using 48 lines, and a mechanical system. A 10-minute film of a miniature windmill in motion is sent from Anacostia to Washington, D. C., a distance of 5 miles. The images were viewed by representatives of the Bureau of Standards, the Navy, the Commerce Department, and others. Jenkins called this "the first public demonstration of radiovision" (although Baird had publicly demonstrated a working television set at Selfridge's Department Store in London two months earlier). 1926. Orrin Dunlap, radio editor of the New York Times, describes television as "an inventor's will-o'-the-wisp." Aug. 18, 1926. A weather map is televised for the first time, sent from NAA Arlington to the Weather Bureau Office in Washington. Apr. 7, 1927. An image of Commerce Secretary Hoover is transmitted in the first successful long distance demonstration of television using Bell Telephone Co. experimental station 3XN, Whippany NJ. 3XN used 1575 kHz video, 1450 kHz audio, 185 synch. AT&T had not previously announced its television research, which was being conducted by Herbert E. Ives and others. May 23, 1927. The first demonstration of television before a large audience, about 600 members of the American Institute of Electrical Engineers and the Institute of Radio Engineers, at the Bell Telephone Building in New York. Sept. 7, 1927. Philo T. Farnsworth demonstrates TV in San Francisco. His transmission was electronic, unlike the mechanical TV of Bell Labs, Jenkins, and others. Jan. 13, 1928. Alexanderson demonstrates the GE system and announces the beginning of television broadcasting. The pictures were received on sets with 1.5 square inch screens in the homes of Alexanderson and two board members in Schenectady. (This is considered by some the first home reception of television in the U. S.) The picture, with 48 lines at 16 frames per second, was transmitted over 2XAF on 37.8 meters and the sound was transmitted over WGY radio station. Apr. 1928. W2XBS New York, RCA, begins in the laboratory. May 11, 1928. The first regular schedule of TV programming is begun by General Electric in Schenectady. Programs are transmitted Tuesday, Thursday, and Friday afternoons from 1:30 to 3:30 p.m., using 24 lines. July 1928. These stations are on the air on this date, according to John Ross: W2XBU Beacon NY (Harold E. Smith); W2XBV New York (RCA); W2XBW Bound Brook NJ (RCA); W2XAV East Pittsburgh (Westinghouse); W4XA White Haven TN; W6XC Los Angeles. July 2, 1928. Charles F. Jenkins begins broadcasting the first regular telecasts designed to be received by the general public. July 12, 1928. First televised tennis match. July 21, 1928. Boston Post reports W1XAY Lexington MA has been licensed. Aug. 22, 1928. WGY simulcasts on radio and TV (WGY, 2XAF and 2XAD) Al Smith accepting the Democratic presidential nomination. This was the first over-the-air remote pickup and the first TV news event. 1929. Milton Berle appears in an experimental TV broadcast. Film of the appearance survives. 1929. W2XBS (RCA) begins two-hour daily broadcasts from Van Cortlandt Park. Mar. 27, 1929. W2XCL Brooklyn NY on air (Pilot Radio and Tube Corp.) begins operating. Mar. 30, 1929. Radio Service Bulletin lists these new stations: W9XAO Chicago IL (Nelson Brothers Bond and Mortgage Co.) 2.0-2.1 MHz, 500 watts; W2XCR Jersey City NJ (Jenkins Television Corporation) 2.1-2.2 MHz, 5000 watts; W2XCL Brooklyn NY (Pilot Electric Manufacturing Co.) 2.0-2.1, 2.75-2.85 MHz, 250 watts; W2XCO New York (RCA) 2.1-2.2 MHz, 5000 watts; W2XR New York (John V. L. Hogan), 500 watts (visual broadcasting and experimental); W2XCW Schenectady (General Electric) 2.1-2.2 MHz 20,000 watts. Apr. 30, 1929. Radio Service Bulletin lists these new stations: W1XB Somerville MA (General Industries Co.) 500 watts (experimental and visual broadcasting). May 11, 1929. The "first regularly scheduled TV broadcasts" begin (one source), three nights per week. May 31, 1929. Radio Service Bulletin lists these new stations: W9XR Downers Grove IL (Great Lakes Broadcasting Co.) 2.1-2.2, 2.85-2.95 MHz, 5000 watts; W2XCP Allwood NJ (Freed-Eisemann Radio Corp.) 2.0-2.1, 2.85-2.95 MHz, 2000 watts (visual broadcasting and experimental). June 27, 1929. First public demonstration of color TV, by H. E. Ives and his colleagues at Bell Telephone Laboratories in New York. The first images are a bouquet of roses and an American flag. A mechanical system was used to transmit 50-line color television images between New York and Washington. July 1929. WOKO Poughkeepsie NY begins transmitting TV as W2XBU in late July 1929. July 31, 1929. Radio Service Bulletin lists these new stations: W9XAA Chicago (Chicago Federation of Labor), 6.08, 11.84, 17.78 MHz, 500 watts. Aug. 31, 1929. Radio World reports WENR radio Chicago receives a license for a 5000 watt TV station (W9XR?). Sept. 30, 1929. Radio Service Bulletin lists these new stations: W1XAV Boston (Shortwave and Television Laboratory Inc.) 2.1-2.2 MHz, 500 watts; W3XL Bound Brook NJ (RCA Communications Inc.) 2.85-2.95 MHz, 30,000 watts. Oct. 31, 1929. Radio Service Bulletin lists these new stations: W10XU Airplane (Jenkins Laboratories), 2.0-2.1 MHz, 10 watts; W10XZ Airplane (C. Francis Jenkins), 1.608, 2.325, 3.088, 4.785, 6.335 MHz, 6 watts. Nov. 30, 1929. Radio Service Bulletin lists these new stations: W9XAP Addison IL (Chicago Daily News), 2.75-2.85 MHz, 5000 watts. 1930. Don Lee's television station opens in Los Angeles. Mar. 1930. (End of March) W1XAY Lexington MA goes off the air, leaving W1XAV temporarily as the only mechanical TV station in Boston. Mar. 31, 1930. Radio Service Bulletin lists these new stations: W2XBO Long Island City NY (United Research Corporation), 2.0-2.1, 2.75-2.85 MHz, 5000 watts; W8XT East Pittsburgh PA (Westinghouse Electric and Manufacturing Co.), 660 kHz, 25,000 watts. Apr. 30, 1930. Radio Service Bulletin lists these new stations: W2XAP Jersey City NJ (Jenkins Television Corporation), 2.75-2.85 MHz, 250 watts. May 22, 1930. An audience at Proctor's Theatre in Schenectady becomes the first to see closed-circuit TV projected onto a big screen. May 31, 1930. Radio Service Bulletin lists these new stations: W10XAL United States (portable) (National Broadcasting Co.), 2.392 MHz, 50 watts; W10XAO United States (portable) (National Broadcasting Co.), 1.584 MHz, 50 watts. Aug. 9, 1930. An Associated Press item has: "Station WMAQ's new television transmitter is to be on the air some time this month. The first regularly scheduled sight programs in conjunction with a sound broadcast station are to provide studio scenes which are to be transmitted three times a day. The television station is W9XAP, 2800 kilocycles." July 30, 1930. NBC opens W2XBS, New York. W2XBS started as an RCA lab rig in Apr. 1928 and was used for big screen theater tests as early as Jan. 1930. In July 1930 it was put in charge of NBC broadcast engineers. Nov. 1930. W9XAP Chicago (Chicago Daily News) broadcast the senatorial election returns. Press release claimed it was the first time a senatorial race, complete with charts showing the standings of the candidates as the votes were tallied, was ever televised. Dec. 13, 1930. Radio World lists W1XY Lawrence MA (Pilot). Feb. 24, 1931. New York Times article (p. 32) refers to daily television broadcasts which began the previous evening on W2XCD (De Forest) in Passaic. Apr. 1931. W2XCR, Jenkins second station, moves from its original site in Jersey City to 655 Fifth Avenue in New York. The station now had 5000 watts power, and could broadcast 60-line pictures rather than 48-line pictures. Apr. 26, 1931. Jenkins Television Corp. gives a public demonstration on W2XCR, beginning a regular schedule of four hours per day, which lasted into early 1932. Simulcast with WGBS radio. May 1, 1931. The first marriage is broadcast on TV, on W2XCR New York. July 21, 1931. W2XAB New York (CBS) begins broadcasting the first regular seven-day-per-week TV broadcasting schedule in the U. S., 28 hours per week with live pickups and a wide variety of programs. The first broadcast included Mayor James J. Walker, Kate Smith, and George Gershwin. Oct. 1931. W1XG Boston on air (Shortwave and Television Laboratory). This was a VHF station with 30 watts. Chief Engineer was Hollis Baird; studios were at 70 Brookline Ave.
Oct. 30, 1931. NBC puts a TV transmitter atop the Empire State Building. The first experimental TV broadcast from the ESB was on Dec. 22, 1931. 1932. RCA demonstrates an all-electronic television system, originally with 120 lines. Aug. 7, 1932. New York Times article describes reception reports received by W2XAB. Nov. 8, 1932. CBS TV reports on the presidential election to an estimated 7500 sets, or 9000 sets according to CBS's estimate. Program consisted of commentary, return charts, still cartoons of politicians. Jan. 25, 1933. W9XK Iowa City, Iowa, begins mechanical TV broadcasts, with sound on its radio station WSUI. The program included a brief overview of the University of Iowa, a musical number, and a drama sketch. W9XK was the first educational station with regularly- scheduled programs. Feb. 20, 1933. CBS suspends television broadcasts. June 27, 1934. W1XAV Boston is discontinued. The FCC told Shortwave and Television Laboratory that the world didn't need two mechanical TV stations. One license was accepted, the other was denied, effective 13 July 1934. At this point Shortwave and Television changed its name to General Television Corp. and switched from a mechanical to an electronic system. Dec. 1934. Philo Farnsworth demonstrates a non-mechanical television system. 1935. (Mid 1935) W1XG Boston changes from a mechanical to an electronic system. Regarding W6XAH in Bakersfield, listed above, Mark D. Luttrell writes that it "was an experimental television station that was operated by Pioneer Mercantile Company in Bakersfield during 1932. The station was an experimental effort by the Schamblin brothers--Frank, Leo and Charles. It has been reported in several publicattions as 'the first television station west of the Mississippi River.' Due to technical problems the work ended later that year and the company then focused on starting a radio station which went on the air as KPMC 1560 AM in 1933 from Bakersfield. The station was later sold and is now owned by Buckley Radio in Connecticut. ...My grandfather worked in management for the company." June 29, 1936. 343-line TV transmitted from the Empire State Building on W2XBS, the first high-definition television. July 7, 1936. NBC's first attempt at actual programming after 6 years of tests: a 30-minute variety show strictly for RCA licensees, speeches, dance ensemble, monologue, vocal numbers, and film clips. Aug. 15, 1936. Broadcasting reports Philco Corp. demonstrates its system of television with seven-mile transmission of live and film subjects in 345-line images 9 1/2 by 7 1/2 inches. Nov. 6, 1936. RCA displays 343-line TV for the press as part of NBC's tenth anniversary celebration. Apr. 1, 1937. Broadcasting reports CBS applies for experimental video station in New York, plans to install RCA TV transmitter in Chrysler building tower and to construct special studios. May 1937. Gilbert Seldes becomes the first TV critic, with an article "Errors of Television" in the Atlantic Monthly. May 15, 1937. Broadcasting reports RCA demonstrates projection television, with images enlarged to 8 by 10 feet, at Institute of Radio Engineers convention. Oct. 13, 1937. FCC adopts new television allocations: seven channels between 44 and 108 MHz (44-50, 50-56, 66-72, 78-84, 84-90, 96-102, and 102-108 MHz), and 12 additional channels from 156-194 MHz. The higher channels are earmarked for a time when workable tubes are devised for these frequencies. May 31, 1938. W2XBS telecasts the movie The Return of the Scarlet Pimpernel, starring Leslie Howard; the staff projectionist played the last reel out of order, ending the film 20 minutes early. After this incident, NBC could not obtain first-run movies for many years. Apr. 30, 1939. President Roosevelt is the first President to appear on television, from the New York World's Fair on W2XBS, now transmitting on 45.25 MHz visual and 49.75 MHz aural. May 17, 1939. A Princeton-Columbia baseball game is telecast from Baker Field in New York by W2XBS, the first sports telecast 4 p.m. to 6:15 p.m. Bill Stern was the announcer. June 1, 1939. First heavyweight boxing match televised, Max Baer vs Lou Nova, form Yankee Stadium. Aug. 26, 1939. First major league baseball game telecast, a double-header between the Cincinnati Reds and the Brooklyn Dodgers at Ebbets Field, Brooklyn, announcer Walter L. "Red" Barber or Bill Stern (sources differ), on W2XBS. Sept. 30, 1939. First televised college football game, Fordham vs Waynesburg, at Randall's Island, New York, on W2XBS. Oct. 22, 1939. First NFL game is televised by W2XBS: the Brooklyn Dodgers beat the Philadelphia Eagles 23-14 at Ebbetts Field in Brooklyn. Play by play announcer was Allen (Skip) Walz. Nov. 10, 1939. W2XB (or W2XD?) (WRGB) Schenectady NY on air (became WRGB in 1942, on ch. 3 (? ), moved from ch. 4 to ch. 6 in 1954). Jan. 1940. The FCC holds public hearings on television. Feb. 1, 1940. The first NBC network television program, from W2XBS to Schenectady. Feb. 25, 1940. First hockey game televised, Rangers vs Canadians, on W2XBS, from Madison Square Garden. Feb. 26, 1940. The first quiz show, Spelling Bee, on WRGB. Feb. 28, 1940. First basketball game televised, from Madison Square Garden, Fordham vs the University of Pittsburgh, by W2XBS. Mar. 10, 1940. W2XBS utilizes the Metropolitan Opera to broadcast a scene from an opera from its television studio. The audio portion is carried over radio station WJZ. Mar. 15, 1940. Broadcasting reports RCA cuts price of television sets, starts sales drive intended to put a minimum of 25,000 in homes in service area of NBC's New York video station. Apr. 1, 1940. Broadcasting reports FCC suspends order for "limited commercial" operation of TV, censures RCA for sales efforts which are seen as an attempt to freeze TV standards at present level, calls new hearing; critics call move "usurpation of power." Apr. 13, 1940. W2XWV (WABD) licensed to DuMont. June 1940. W2XBS (NBC) covers the Republican National Convention from Philadelphia for 33 hours over five days. Aug. 1940. W9XBK (WBKB) Chicago on air (Balaban & Katz/Paramount). Aug. 29, 1940. Peter Goldmark of CBS announces his invention of a color TV system. Sept. 3, 1940. First showing of high definition color TV, by W2XAB, transmitting from the Chrysler Building, using 343 lines. This was the first telecast of any kind from CBS since the closing of their scanner station 2/2/33. 1941. W6XYZ (KTLA) Los Angeles on air. 1941. The following stations are listed with 1941 start dates in the 1950 Broadcasting Yearbook: ch. 4, WBKB, Chicago, IL; ch. 2, WCBS-TV, New York, NY; ch. 3, WPTZ, Philadelphia, PA.
Mar. 8, 1941. NTSC formally recommends TV standards to the FCC, calling for 525 lines and 30 frames per second. Apr. 30, 1941. The FCC approves the NTSC standards and authorizes commercial TV to begin on July 1. May 2, 1941. 10 stations granted commercial TV licenses effective July 1. Stations were required to broadcast 15 hours per week. W2XBS received license number 1. June 30, 1941. Broadcasting reports Bulova Watch Co., Sun Oil Co., Lever Bros. Co. and Procter & Gamble sign as sponsors of first commercial telecasts on July 1 over WNBT New York. July 1, 1941. Commercial TV authorized. Aug. 7, 1941. The first audience-participation program, a program of charades, is broadcast on WNBT. Jan. 6, 1942. FCC grants permission to Du Mont Laboratories to build a commercial TV station, to operate on 78-84 MHz (then channel 4). Apr. 13, 1942. Broadcasting reports minimum program time required of TV stations is cut from 15 hours to four hours a week for war period. Dec. 23, 1943. The first complete opera, Hansel and Gretel, is telecast, by WRGB Schenectady. 1944. A photograph dated 1944 in Please Stand By shows a card labeled "W6XYZ NEWSROOM." The newcaster has a large map of Europe on his right and a globe on his left. May 1, 1944. Broadcasting reports CBS proposes starting off postwar TV with high-definition, full-color pictures, broadcast on 16 MHz bands. May 22, 1944. Broadcasting reports single ownership of five TV stations is permitted by FCC, up from former limit of three. Oct. 2, 1944. Broadcasting reports FCC opens hearings on postwar allocations with testimony of Radio Technical Planning Board that agreement had been reached to recommend the 41-56 MHz band for FM, TV allocations to extend upwards from there. Oct. 9, 1944. Broadcasting reports CBS, in testimony presented by Paul Kesten, executive vice president, asks for more space for FM, with TV being moved to UHF part of spectrum above 300 MHz. Jan. 15, 1945. FCC announces allocations proposal for spectrum above 25 MHz: 44-50 Television; 50-54 Amateur; 54-84 Television 84-88 Educational FM broadcasting; 88-102 Commercial FM broadcasting; 102-108 (Non-Government but not yet determined). Alternative 1: 44- 48 Amateur; 48-50 Facsimile; 50-54 Educational FM broadcasting; 54-68 Commercial FM broadcasting; 68-74 Television; 74-78 Non-Government fixed & mobile -aero markers on 75 MHz to remain as long as required; 78-108 Television, fixed, mobile [shared]. Alternative 2: 44-56 Television; 56-60 Amateur [the same as pre-WW2]; 60-66 Television; fixed; mobile [shared]; 66-68 Facsimile; 68-72 Educational FM broadcasting; 72-86 Commercial FM broadcasting. aero markers remain on 75 MHz as long as required; 86-92 Television; 92-104 Television, fixed, mobile [shared]; 104-108 Non-Government fixed and mobile. June 4, 1945. Broadcasting reports in joint request, FM Broadcasters Inc. and Television Broadcasters Association ask FCC to allocate 44-108 MHz immediately: FM to get 50-54 MHz for educational use, 54-68 MHz for commercial operation; TV to receive 68-74 MHz and 78-108 MHz. June 27, 1945. FCC allocates 88-92 educational FM; 92-106 commercial FM; 106-108 facsimile broadcasting; 92.1-93.9 community; 94.1-103.9 metro; 104.1-105.9 rural; TV channel 1 44-50; TV channel 2-6 according to the present scheme. Jan. 31, 1946. WTZR Chicago IL on air (Zenith). Feb. 4, 1946. Broadcasting reports CBS demonstrates color-television film program broadcast from its new UHF transmitter; says with industry cooperation color for the home can be available within a year. Feb. 18, 1946. Broadcasting reports first Washington-New York telecast through AT&T coaxial cable is termed success by engineers and viewers. Feb. 25, 1946. New TV channel assignments go into effect; among the changes: WCBW from 60-66 to (2) and WNBT from 50-56 to (4). Apr. 22, 1946. Broadcasting reports CBS color-television program is successfully transmitted over 450-mile coaxial cable link from New York to Washington and back. May 9, 1946. First variety show premieres, Hour Glass, on NBC. The show ran 10 months. June 19, 1946. First televised heavyweight title fight (Joe Louis vs Billy Conn), broadcast from Yankee Stadium, is seen by the largest television audience to see a fight. 141,000. Sept. 6, 1946. W9XBK changes its call to WBKB(TV) Chicago IL, ch. 4 (later ch. 2; later call WBBM-TV). Sept. 30, 1946. Broadcasting reports CBS petitions FCC to adopt standards and authorize commercial operation of color-television stations in UHF frequencies immediately. Oct. 2, 1946. Faraway Hill airs on the DuMont network, becoming the first TV network soap opera. Nov. 1, 1946. WCBW changes call to WCBS-TV. Nov. 4, 1946. Broadcasting reports RCA demonstrates all-electronic system of color TV. Nov. 11, 1946. Broadcasting reports Bristol-Myers is the first advertiser to sponsor a television-network program, Geographically Speaking, which started Oct. 27 on NBC-TV's two-station network. Dec. 24, 1946. The first church service telecast, Grace Episcopal Church in New York, on WABD on the New York-Philadelphia-Washington network. Jan. 22, 1947. KTLA(TV) on air as W6XYZ changes call to KTLA(TV) (5), first commercial TV west of Chicago. A 30-minute show is telecast from the Paramount TV stage, featuring Bob Hope, Jerry Colonna, Dorothy Lamour, and William Bendix. The FCC microfiche records show the station was granted a Special Temporary Authorization for commercial operation on 1/9/47 and that the date of its first commercial license was 2/9/53. Jan. 30, 1947. The FCC declares that the CBS color system is "premature" and requires further testing before it could be approved. Feb. 8, 1947. KSD-TV St. Louis MO on air, ch 5. Mar. 4, 1947. WWDT (WWJ-TV) Detroit MI, ch 4, experimental (regular programs June 3). Mar. 24, 1947. Broadcasting reports FCC denies CBS petition for commercial color-TV operation, sends color back to labs for continued search for "satisfactory" system. May 7, 1947. Kraft Television Theater premieres on NBC, the first regularly scheduled drama series on a network. June 27, 1947. WNBW-TV (WRC-TV) Washington DC on air (was W3XNB). Sept. 13, 1947. WFIL-TV Philadelphia PA on air, ch. 6. Sept. 30, 1947. The opening game of the World Series is the first World Series game to be telecast, between the New York Yankees and the Brooklyn Dodgers at Yankee Stadium. The game was carried by WABD, WCBS-TV, and WNBT in New York, and was also telecast in Philadelphia, Schenectady, and Washington. The 1947 World Series brought in television's first mass audience, and was seen by an estimated 3.9 million people, mostly in bars [Tim Brooks]. Oct. 3, 1947. WMAL-TV (WJLA-TV) Washington DC on air, ch. 7, the first VHF high band station. Oct. 17, 1947. WEWS Cleveland OH on air. Oct. 27, 1947. WMAR-TV Baltimore MD on air, ch. 2. Nov. 6, 1947. Meet the Press first appears as a local program in Washington. Nov. 17, 1947. Broadcasting reports television network service extends to Boston with the opening of AT&T radio relay system between that city and New York. Dec. 17, 1947. WEWS Cleveland OH on air, ch. 5. Dec. 27, 1947. Puppet Television Theater (later called Howdy Doody Time), debuts on NBC TV with Buffalo Bob Smith. It was carried by six stations. 1948. ABC broadcasts the series On the Corner on four stations. ABC considers this its first network show, although an earlier show, Play the Game, produced by ABC using DuMont's facilities, was seen on a network. 1948. CBS begins network programming. Jan. 1, 1948. New York Times lists: (2) WCBS-TV, (4) WNBT, (5) WABD. Jan. 18, 1948. The Original Amateur Hour with Ted Mack debuts. Feb. 9, 1948. WLWT(TV) Cincinnati OH on air, ch. 4 (later ch. 5). Mar. 1, 1948. WCAU-TV Philadelphia PA on air (was W3XAU). Mar. 11, 1948. WBAL-TV Baltimore MD on air, ch. 11. Mar. 15, 1948. WCAU-TV Philadelphia PA on air, ch. 10. Apr. 5, 1948. WGN-TV Chicago IL on air, ch. 9. Apr. 22, 1948. WTVR (WTVR-TV) Richmond VA on air, ch. 6. May 6, 1948. KTSL(TV) (KNXT) Los Angeles CA on air, ch. 2. May 10, 1948. Broadcasting reports FCC orders into effect earlier proposal assigning TV ch. 1 (44-50 mc) to nongovernmental fixed and mobile services, denying FM spokesmen's pleas for that channel for use in FM network relaying; gives FM stations in 44-50 mc band until end of year to move to 88-108 mc; issues proposed new expanded TV allocation table; calls hearing on feasibility of TV use of frequencies above 475 mc; proposes required minimum hours of TV station operation be scaled from 12 hours a week for first 18 months to 28 hours a week after 36 months. May 14, 1948. WBEN-TV Buffalo NY on air, ch. 4. June 8, 1948. Milton Berle Show premieres on NBC. June 9, 1948. WBZ-TV Boston MA on air, ch. 4. June 21, 1948. First network telecast of political conventions; both parties meet in Philadelphia that year; telecasts reach cities connected to network lines with Philadelphia. NBC sends edited kinescope recordings for next-day telecasts on those stations not yet connected to the network. June 21, 1948. WNAC-TV (WNEV-TV, WHDH) Boston MA on air, ch. 7. July 21, 1948. WSPD-TV Toledo OH on air, ch. 13. July 30, 1948. Professional wrestling premieres on prime-time network TV (DuMont). Aug. 10, 1948. WJZ-TV (WABC-TV) New York NY on air, ch. 7, 7 p.m. The first broadcast originated from the Palace Theater on Broadway with a four-hour show. The opening act was Carlton Emmy's dog act, followed by stars such as Ray Bolger, Beatrice Lillie, Pat Rooney, Ella Logan, James Barton, Willie West and McGinty, Buck and Bubbles, Walter "Dare" Wahl, Gus Van, Henry Morgan, Raye and Naldi, and Paul Whiteman and his orchestra. Aug. 10, 1948. Candid Camera debuts on ABC. Aug. 15, 1948. The first network nightly newscast, CBS-TV News, debuts on CBS with Douglas Edwards. Aug. 25, 1948. KSEE (KFI-TV, KHJ-TV) Los Angeles CA on air, ch. 9 (was W6XEA). However another source says KHJ-TV went on the air as KFI-TV on Oct. 6, 1948. Aug. 27, 1948. Whitaker Chambers, appearing on Meet the Press, accuses Alger Hiss of being a communist. Sept. 17, 1948. KLAC-TV (KCOP-TV) Los Angeles CA on air, ch. 13; WENR-TV (WBKB-TV, WLS-TV) Chicago IL on air, ch. 7. Sept. 29, 1948. WBAP-TV Fort Worth TX on air, ch. 5. Oct. 8, 1948. WNBY (WNBQ, WMAQ-TV) Chicago IL on air, first telecast (a World Series game). Broadcasting magazine says WNBQ went on the air Sept. 1, 1948. Oct. 9, 1948. WXYZ-TV Detroit MI on air, ch. 7. Oct. 24, 1948. WJBK-TV Detroit MI on air, ch. 2. Oct. 31, 1948. WNBK (KYW-TV, WKYC-TV) Cleveland OH on air, ch. 4 (later ch. 3). Nov. 2, 1948. WAAM-TV (WJZ-TV) Baltimore MD on air, ch. 13. Nov. 24, 1948. WAVE-TV Louisville KY on air, ch. 5 (later ch. 3). Nov. 25, 1948. KRSC-TV (KING-TV) Seattle WA on air, ch. 5. Nov. 27, 1948. WDTV (KDKA-TV) Pittsburgh sends out its first signal, ch. 3 (although Jan. 11, 1949, is considered the start date below). Dec. 11, 1948. WMCT (WMC-TV) Memphis TN on air, ch. 4 (later ch. 5). Dec. 18, 1948. WDSU-TV New Orleans LA on air, ch 6. 6 p.m.
Dec. 22, 1948. KGO-TV San Francisco CA on air. Dec. 24, 1948. The first Catholic midnight mass is telecast by WNBT, WJZ-TV, and WCBS-TV. Jan. 1, 1949. KLEE-TV (KPRC-TV) Houston TX on air, ch. 2; KTTV Los Angeles on air. Jan. 3, 1949. Colgate Theatre premieres on NBC. Jan. 10, 1949. The Goldbergs premieres on CBS. Jan. 11, 1949. A two-hour special on all networks celebrates the linking of eastern and midwestern networks via coaxial cable; WDTV (KDKA-TV) Pittsburgh PA on air, ch. 3 (later ch. 2). Jan. 16, 1949. KNBH (KRCA, KNBC) Los Angeles CA on air; WOIC (WTOP-TV) Washington DC on air. Jan. 17, 1949. Broadcasting reports AT&T coaxial cable links East Coast and Midwest television stations. Jan. 31, 1949. Broadcasting reports first Emmy awards ceremony is held, and broadcast by KTSL(TV) Los Angeles. Feb. 23, 1949. WHIO-TV Dayton OH on air, ch. 13 (later ch. 7). Mar. 8, 1949. WAGA-TV Atlanta GA on air. Mar. 15, 1949. WLWD (WDTN-TV) Dayton OH on air, ch. 5 (later ch. 2); WICU-TV Erie PA on air, ch. 12. Mar. 18, 1949. WGAL-TV Lancaster PA on air, ch 4 (later ch. 8). Mar. 21, 1949. WTVJ(TV) Miami FL on air. April 1949. KTLA Los Angeles broadcasts 27 hours and 30 minutes of live coverage of the effort to rescue three-year-old Kathy Fiscus, who had fallen into a well. The event gripped Los Angeles and stimulated sales of TV sets in the city. Apr. 3, 1949. WLWC Columbus OH on air, ch. 3 (later ch. 4). Apr. 4, 1949. WKRC-TV Cincinnati OH on air, ch. 11 (later ch. 12). May 1949. The first telethon, benefitting the Damon Runyon Cancer Fund, is hosted by Milton Berle. It aired for 24 hours. May 5, 1949. KGO-TV San Francisco CA on air. May 9, 1949. Broadcasting reports FCC authorizes NBC to operate a UHF station at Bridgeport CT for experimental rebroadcasts of programs of WNBT New York. May 16, 1949. KFMB-TV San Diego CA on air; Milton Berle appears on the covers of both Time and Newsweek. May 22, 1949. WAFM-TV (WABT, WAPI-TV) Birmingham AL on air. May 30, 1949. WFBM-TV Indianapolis IN on air, ch. 6 [station broadcasst the Indianapolis 500 on its first day of operation]; Broadcasting reports longest direct TV pickup, 129 miles, is made by KFMB-TV San Diego during dedication when it got and rebroadcast salute from KTLA(TV) Los Angeles without special equipment of any kind. June 1, 1949. KSL-TV Salt Lake City UT on air, ch. 5. June 6, 1949. WKY-TV Oklahoma City OK on air, ch. 4. June 11, 1949. WHAM-TV (WROC-TV) Rochester NY on air, ch. 6 (later ch. 5, and later in a trade to ch. 8). June 27, 1949. Captain Video debuts on DuMont. July 1, 1949. WBRC-TV Birmingham AL on air, ch. 4 (to ch. 6 in 1953); WTCN-TV (WCCO-TV) Minneapolis-St. Paul MN on air, ch. 4. July 10, 1949. WJAR-TV Providence RI on air, ch. 11 (later ch. 10). July 11, 1949. FCC announces TV allocation plan; to add 42 UHF channels to the present 12 VHF channels, with another 23 to 28 UHF channels reserved for experimental television, providing for 2,245 TV stations in 1400 communities. July 15, 1949. WBTV Charlotte NC on air, ch. 3. July 18, 1949. WJAR-TV Providence RI on air, ch. 11 (moved to ch. 10 in May 1953). July 26, 1949. WCPO-TV Cincinnati OH on air, ch. 7 (later ch. 9). Aug. 15, 1949. WLAV-TV (WOOD-TV) Grand Rapids MI on air, ch. 7 (later ch. 8). Aug. 25, 1949. RCA announces the development of a compatible color TV system. Aug. 29, 1949. WOW-TV Omaha NE on air, ch. 6. Aug. 30, 1949. WTVN-TV Columbus OH on air, ch. 6. Sept. 1, 1949. KMTV Omaha NE on air, ch. 3. Sept. 15, 1949. WMBR-TV (WJXT) Jacksonville FL on air, ch. 4; WJAC-TV Johnstown PA on air, ch. 13 (later ch. 6). Sept. 16, 1949. KECA-TV (KABC-TV) Los Angeles CA on air. Sept. 17, 1949. KBTV (WFAA-TV) Dallas TX on air, ch. 8. Sept. 22, 1949. WFMY-TV Greensboro NC on air, ch. 2. Oct. 5, 1949. WBNS-TV Columbus OH on air, ch. 10. Oct. 6, 1949. The Ed Wynn Show becomes the first regularly scheduled network show to broadcast from the West Coast, where it is seen live. Oct. 11, 1949. WOR-TV (WWOR-TV) New York NY on air, ch. 9 (was W2XBB; later to Secaucus NJ). An Internet web page says the inaugural broadcast was Oct. 11 1949 and began at 7 p.m., with soprano Joan Roberts accompanied by an off-stage pianist in the 15-minute "Joan Roberts Show." That was followed by "Apartment 3C," a domestic comedy starring John and Barbara Gay and the "John Reed King Show," a giveaway sponsored by Flagstaff Foods, "The Handy Man," featuring Jack Creamer with tips for homemakers. Then "The Barry Gray Show" with guests Myron Cohen, Irving Caesar, Tony Canzoneri, the Di Castro Sisters and Hope Miller with interviews conducted from the roof studio at the New Amsterdam Theater. Oct. 16, 1949. WDAF-TV Kansas City MO on air, ch. 4. Oct. 22, 1949. KOTV Tulsa OK on air, ch. 6. Oct. 31, 1949. WOC-TV (KWQC) Davenport IA on air, ch 5 (later ch. 6). Nov. 11, 1949. WTTV Bloomington-Indianapolis IN on air, ch. 10 (later ch. 4). Nov. 15, 1949. KRON-TV San Francisco CA on air; WSAZ-TV Huntington WV on air, ch. 5 (later ch. 3). Dec. 1, 1949. WNBF-TV Binghamton NY on air, ch. 12; WKTV Utica NY on air, ch 13 (later ch. 2). Dec. 3, 1949. KRLD-TV (KDFW-TV) Dallas TX on air, ch. 4. Dec. 4, 1949. KPHO-TV Phoenix AZ on air. Dec. 11, 1949. WOAI-TV San Antonio TX on air, ch. 4. Dec. 19, 1949. WXEL (WJW-TV) Cleveland OH on air, ch. 9 (later ch. 8). Dec. 29, 1949. KC2XAK, first experimental UHF TV station operating on a regular basis is opened by NBC at Bridgeport CT on 529-535 MHz. Feb. 2, 1950. What's My Line debuts on CBS. Feb. 15, 1950. WSYR-TV Syracuse NY on air, ch. 5 (later ch. 3); KEYL (KGBS-TV, KENS-TV) San Antonio TX on air, ch. 5. Feb. 21, 1950. WOI-TV Ames IA on air, ch 4 (later channel 5). Feb. 25, 1950. Your Show of Shows premieres on NBC. Apr. 2, 1950. WTAR-TV Norfolk VA on air, ch. 4 (later ch. 3). May 1, 1950. WJIM-TV Lansing MI on air, ch. 6. May 29, 1950. Broadway Open House debuts. June 1, 1950. WKZO-TV Kalamazoo MI on air, ch. 3. July 1, 1950. WHBF-TV Rock Island IL on air, ch. 4. July 10, 1950. Your Hit Parade premieres on NBC. Sept. 4, 1950. Broadcasting reports FCC states it will adopt the CBS color-television system unless set makers agree to "bracket standards" to enable sets to receive both present 525-line pictures and the 405-line images proposed by CBS; if they agree, commission will adopt "bracket standards" for black-and-white TV and postpone color decision. Sept. 30, 1950. WSM-TV Nashville TN on air, ch. 4. Oct. 10, 1950. The FCC approves CBS color TV system, effective Nov. 20. CBS promises 20 hours of color programs a week within two months. RCA continues work on its compatible system. Manufacturers are divided as to whether to make sets and converters to receive CBS colorcasts. Mar. 26, 1951. Broadcasting reports FCC reveals proposed allocation plan making full use of UHF band in addition to 12 VHF channels to provide for some 2,000 TV stations in more than 1,200 communities. May 28, 1951. The U. S. Supreme Court upholds the FCC's approval of the CBS color system. June 25, 1951. CBS broadcasts color using its non-compatible system. The one-hour program, called Premiere, featured Ed Sullivan and other CBS stars, and is carried on a five-station East Coast CBS-TV hookup. The network estimated that 40,000 persons saw what it called the first sponsored color program in television history. Late June 1951. RCA demonstrates its new electronic color system. Aug. 11, 1951. First baseball games televised in color, a double-header between the Brooklyn Dodgers and the Boston Braves, by WCBS-TV. Red Barber and Connie Desmond were the announcers. Sept. 4, 1951. First transcontinental TV broadcast, featuring President Truman. Sept. 22, 1951. First live sporting event seen coast-to-coast: a college football game between Duke and the University of Pittsburgh, at Pittsburgh (NBC-TV). Oct. 1, 1951. WLTV (WAII-TV, WQXI-TV) Atlanta GA on air, originally ch. 8, later ch. 11. Oct. 15, 1951. I Love Lucy premieres on CBS. Nov. 18, 1951. See It Now premieres on CBS, showing live shots of the Statue of Liberty and San Francisco Bay. Dec. 24, 1951. First televised opera written for television, Amahl and the Night Visitor, on NBC. 1952. KTLA makes the first telecast of an atomic bomb detonation. Klaus Landsberg led the engineering feat on short notice that established microwave links that had previously been considered impossible with existing technology. The station fed the coverage to the nation. Jan. 14, 1952. Today show premieres on NBC. Apr. 14, 1952. FCC lifts TV freeze as of July 1; provides for 617 VHF and 1436 UHF allocations, including 242 non-commercial educational stations; establishes 3 zones with different mileage separation and antenna-height regulations; changes required of 30 TV stations. Sept. 18, 1952. KPTV(TV) Portland OR on air, the first commercial UHF TV station, transmits its first test pattern, on ch. 27. Sept. 23, 1952. Richard Nixon's "Checkers" speech is delivered. Late 1952 to 1954. Numerous TV stations switched channels. This list may not be complete. Mar. 8, 1953. WFMJ-TV Youngstown begins broadcasting on channel 73, the highest channel so far. Mar. 25, 1953. CBS concedes victory to RCA in the war over color TV standards. Apr. 3, 1953. First issue of TV Guide is published, with 10 editions and a circulation of 1,562,000 copies. May 25, 1953. KUHT Houston TX on air, the first non-commercial educational TV station, begins regular programming. Aug. 30, 1953. NBC's Kukla, Fran, and Ollie Show is broadcast in color, the first publicly announced experimental network broadcast in compatible color. Sept. 28, 1953. Broadcasting reports that, with the end of daylight saving time, CBS and NBC inaugurate "hot kinescope" systems to put programs on air on the West Coast at same clock hour as in the East. Oct. 19, 1953. Arthur Godfrey fires Julius La Rosa on the air. Dec. 17, 1953. FCC reverses its 1951 decision and approves the RCA/NTSC color system. NBC broadcasts the NBC chimes image at 5:31:17 p.m. using NTSC standards. CBS broadcasts the first live color program at 6:15 p.m.; NBC followed with a live program at 6:30 p.m.
Jan. 1, 1954. NBC broadcasts the Rose Parade in color on 21 stations. Mar. 9, 1954. Edward R. Murrow denounces Sen. Joseph R. McCarthy on See It Now. Dec. 13, 1954. Broadcasting reports WBRE-TV Wilkes-Barre PA is ready to become the first UHF station to use 1,000 KW, maximum ERP authorized by the FCC. July 2, 1955. The Lawrence Welk Show debuts on ABC television. Sept. 28, 1955. First World Series game broadcast in color, by WRCA-TV. Apr. 1956. WNBQ Chicago replaces all black-and-white equipment with color equipment, becoming first TV station to broadcast all its local programming in color. Apr. 1956. Ampex demonstrates first practical videotape recorder at NAB Convention in Chicago. The three networks immediately place orders for Ampex VTR's, which begin to arrive later in the year. July 2, 1956. Broadcasting reports FCC uncovers plan for long-range shift of TV to all UHF and, for present, proposes deintermixture in 13 markets. Aug. 8, 1956. Final telecast of the Dumont network, a boxing card. Although Dumont ceased network operations, the boxing show continued locally in New York until 1958. CBS inherits the rest of the Dumont/NFL football deal, giving the NFL its first-ever true national TV exposure. Oct. 29, 1956. Chet Huntley and David Brinkley take over anchor duties of NBC newscast, which is renamed "The Huntley-Brinkley Report." Mar. 16, 1962. Walter Cronkite succeeds Douglas Edwards as anchorman of the CBS Evening News. July 23, 1962. A joint ABC/CBS/NBC production is telecast to Europe via Telstar. The program featured excerpts of a baseball game at Wrigley Field, Chicago, a live news conference by President Kennedy, and a concert by the Mormon Tabernacle Choir, who had traveled to Mount Rushmore to perform. 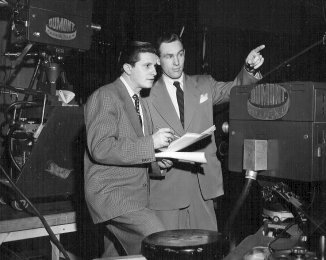 The host of the U. S.-to-Europe program was Chet Huntley of NBC. May 15, 1963. First TV pictures transmitted from a manned U.S. space capsule, astronaut Gordon Cooper's "Faith 7." Because the picture quality is poor, only NBC carries the transmission, and on tape-delay, not live. Sept. 2, 1963. CBS becomes first network to expand early-evening network news from 15 to 30 minutes. Sept. 9, 1963. NBC expands early-evening network news to 30 minutes. (ABC did not follow until Jan. 2 1967, since their affiliates were strongly opposed to give up the extra 15 minutes, especially as ABC's news was then a very-distant third place). Apr. 30, 1964. Television sets manufactured as of this date are required to receive UHF channels. Oct. 10, 1964. Live telecast on NBC-TV (via Syncom III) of the opening ceremonies of the 1964 Summer Olympics in Tokyo (airing on the U. S. East Coast from 1 to 3 A.M.); first live color TV program ever transmitted to the U. S. by satellite. Mar. 24, 1965. Live TV pictures from unmanned U. S. moon probe Ranger 9 transmitted prior to impact in the crater Alphonsus. May 1967. Premiere of the Las Vegas Late Show with Bill Dana, which was supposed to be the cornerstone of the United Network, an attempt to launch a fourth commercial TV network. In less than a month, both the show and the fourth network idea get canceled. Oct. 14, 1968. First live network transmission of TV pictures from inside a manned U.S. space capsule in orbit: Apollo 7 There were six such broadcasts during their eleven-day mission.